I have always had a reputation for being cantankerous particular about my bed. It has to be made, it has to be made my way, and it has to stay the way I left it all day. My poor sisters — I would go into a panic if I walked into our bedroom and saw a person-shaped depression in my down comforter. 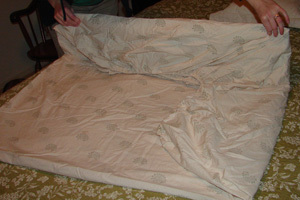 A well-made bed for me, though, starts with carefully folded sheets. 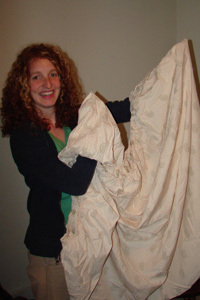 I guess I also have a reputation for best sheet-folder, because somehow I’ve been nominated to offer you this “how to fold a fitted sheet” tutorial. Grab your sheets, and let’s go! 1. 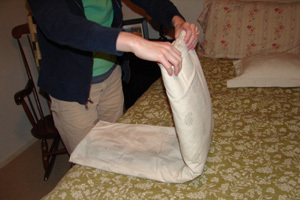 Starting with one side, slip your index fingers inside the pockets, holding the sheet up by two points. 2. Bring the tips of your index fingers together. 3. Flip one pocket over the other. 5. Slip hands inside the doubled-up pockets, index fingers again holding the sheet up by two points. 8. Look! You’re almost there! 9. 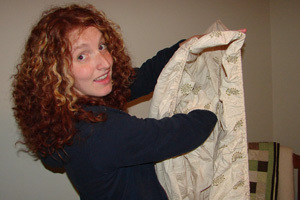 Lay sheet flat. Smooth, and straighten all sides. 12. Fold in half, and then half again. 14. Now your fitted sheet will be the perfect size to fit inside a folded flat sheet, along with folded pillow cases — and that’s how I store my sheet sets. Got it? Good! Now, go forth and fold away! I’m with you, I like to get into a made bed as well and have been known to make it just before getting ready to turn in. Oh no! As I was typing this I realized I have never taught my girls to fold sheets since I do all the laundry. (And since we usually wash them and put them right back on.) I must give Kara a crash course before she leaves home! 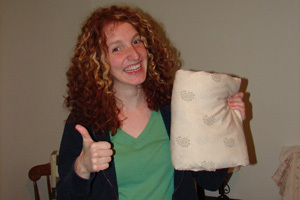 @sam: My grandmother complimented me on my sheet folding, too! I’ll never forget — it’s one of my sweetest Grandma memories! I don’t know how you do it without anyone else!!! I’ve tried before… It always ends up terribly. 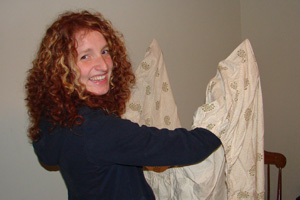 I loved the pictures.What a hoot!We were never taught how to fold fitted sheets properly growing up. I remember when my mother in law was sick and a couple came and helped us out and they folded towels in half and then in thirds. It changed my life. 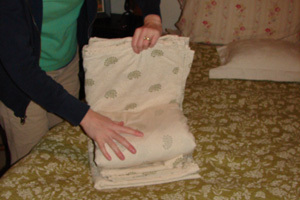 Danica may not remember, but the “let’s fold the fitted sheets this way” came from watching Aunt Gerry do laundry; her linen closet was always neatly stacked. It was my envy and inspiration all at once. So we watched her fold sheets, observing that they were always stored away in complete sets. I loved it! I knew I had to get better at this – then Danica came along and perfected it! Learning from watching others is the best. I learned to fold jeans visiting a high school friend and seeing her mom fold one pair after another. I may have been conversing with my friend, but my eyes never left the mom, taking in every repeated movement. I could hardly wait to get home and try folding my own jeans her way! He..he..We women should let some of the college-age , single guys in on this website. Have you seen the debacle men can make out of sheets ? This pictorial will lead them step by step !! Then , when they get married..what a blessing they shall be to their spouse !! Oh yeah !! Ladies, I am loving this whole concept. Makes being away from NNY a little more tolerable..b/c I feel like I’m keeping “in touch” with our CFC “family”. Love you all SO much ! Amazing! I thought I was the only obsessive woman who actually does this! It makes for a much neater bed. Yay! Keep inspiring us! How Fun are you and your sisters! This is great, and I am learning tons of new skills! I agree with Ryan, you need a raise!!!! 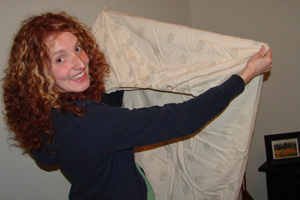 To avoid the embarrassing ‘teeth hold,’ start at one corner, then travel around the sheet, stuffing the adjacent corners inside the first as you go. It’s much easier for folding solo. Yes, that is how I do it – just like Martha. Thanks for posting the link, Sarah, now I don’t have to post pictures on my site. :) I have been known to not pay attention, start folding with the sheet on the right side and end up with the inside-out on the finished project. Of course I then have to take it apart and refold it because, heaven knows, the world will be totally askew if my sheets were not folded 100% correctly. (You never know who might look in the linen closet and be totally dismayed!) No, I’m not OCD in any way. Why do you ask? 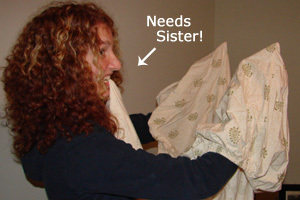 Trying to fold Fitted Sheets has been a bane of homemaking for me! Having a neatly organized linen closet is one of those things that is quite important to me, I had finally figured out something I’m only half happy with. 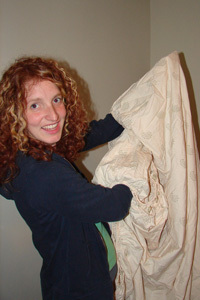 I have to tell you that I immediately pulled a twin size fitted sheet out of my closet to give your tutorial a hands on try…. and it works! :-O Imagine my shock that I can fold a fitted sheet successfully! I love that you ladies are putting up things like this to help the rest of us!!! Triple Fold!!! That is what has been missing all along!!! I have loathed fitted sheets because it never seemed to work anyway. Today I gave the “triple fold” a chance and voila! Thanks!!! And I’ll take your pictures over Martha Stewart’s video any day! I honestly didn’t know there was a way to fold fitted sheets that didn’t end in a wrinkled ball. Thanks! 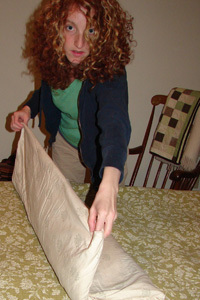 I had finally gotten too frustrated with folding fitted sheets and searched on the web. This is the only one that said to fold the second set of corners of the OTHER way so they fit perfectly into the first set. THANK YOU THANK YOU THANK YOU!!! I went and refolded the whole closet. It looks very pretty! again. thank you. i can’t wait for my husband to see the “new way” of folding the fitted sheets. *giggle* he’ll be in awe…. Thank you so much for this tutorial! 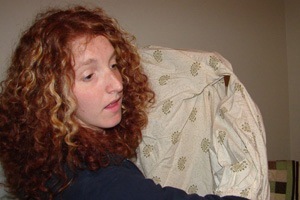 I just finished folding my fitted sheet and it looks just like your picture, except mine are red. I can’t wait to impress somebody with my new fitted-sheet folding skills, haha. I have always HATED folding sheets because of the fitted sheet. I get so frustrated I would always smash it into a ball and stuff in the corner of my closet, but not anymore!! This is great. I have done it a couple of times then I stop and forget. Now I wil stay with it.